I have had a busy couple of days in my little creative haven down in the basement. I have been working on a couple of projects which may or may not come to something, watch this space! I also started a 6 week online Adobe Illustrator course in a bid to improve my self taught skills. I am only at lesson 3 and I am learning heaps already. I already knew the long way around many of the tasks but now I have been learning the shorter more efficient methods for getting there. This will improve productivity I hope, as more often than not I have a great idea just not quite sure how to do it. Which is when procrastination steps in and I end up giving up half way through and never going back to said idea! Just think of all those things I can revisit with my new found skills. 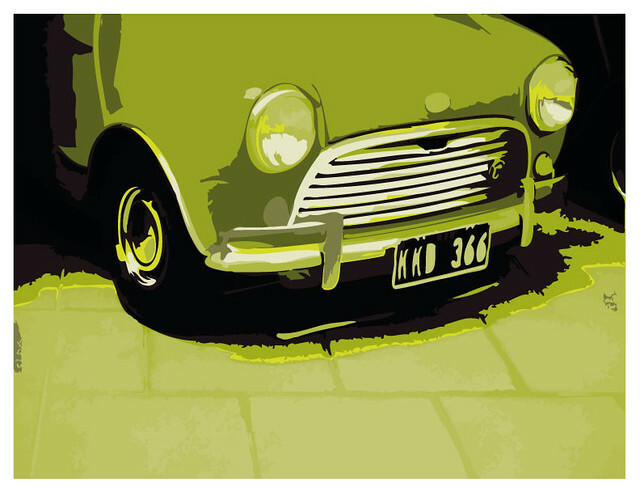 My fun mini shot is my assignment for the first lesson using Live Trace and Paint features. Basic stuff but good practice.